It was many years ago that I went to Brisbane and Surfers Paradise but my daughter went there just a few years ago and from all accounts it’s still the same. Brisbane is of course on the east coast is the gateway to the Great Barrier Reef. So that’s Aussies claim to fame; the largest barrier reef in the world. 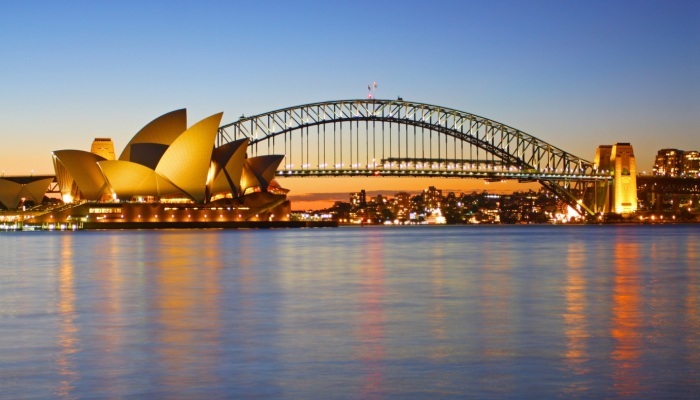 And some would also say the Sydney Opera House to. The crocodile hunter Steve Irwin cemented this part of Australia on the map. In December of 2008 I went to Western Australia. The city of Perth is actually closer to Singapore and Jakarta than it is to Sydney. Western Australia. Perth is the largest city here and a nice city at that. For the first few days I stayed with family in Ellenbrook. From here you can go and see the area known as Swan Valley and do vineyard tours. It is very dry and hot here with temperatures in the 30s (Celsius) by the middle of October. In the height of summer it will be in the 40s.In the afternoons a sea breeze comes up which is called the Fremantle Doctor. It gives a little relief from the siring heat. Perth itself is very laid back with no need to rush anything. Kings Park is up on a hill and from here you get a great view over Perth and the Swan River. In the centre of the city your main shopping is on Hay and Murray Streets. With such a huge diverse cultural mix of people living in Perth finding a restaurant to eat Chinese, Italian, Turkish, Polish or whatever takes your fancy this not going to be a problem. The transport in Perth is excellent and with buses, trains and ferries you can get to where you want without much trouble at all. In the centre of the city they have what is called the ‘free transit zone’. Yes it doesn’t cost you anything. The Indian Pacific rail service will take you all the way to Adelaide and Sydney. Of course North and South of Perth is going to see you lying on some of the best beaches in the world. There are loads of sports clubs and sport crazy people here. Who can blame them when the Indian Ocean is right on their door step. Fremantle was put on the map in a big way when Australia won the America’s Cup. Suddenly it was the place to be. It underwent a big tidy up phase for the America’s Cup challenge and I must say it does look good even today several years down the track. It has a very nice shopping area and like Perth because of the heat there is an abundance of cafes where sitting outside in the shade to have your coffee is the norm in the area called the Cappuccino Strip. It has retained its old charm with its picturesque old buildings. Stroll along to the Fremantle Markets and down to the boat harbour.Dont forget to do the E-shed markets at the dockside which has over 80 stalls. There is a variety of sights and sounds to experience here and they can all be down by walking. The Fremantle Fishing Boat Harbour is busy all year round and has an array of restaurants with cuisine catering to all tastes. Hop on a tour or cruise boat from here and enjoy a day out. Next catch a boat to Rottnest Island. Rottnest Island is around a half hour boat ride from Fremantle and a super spot to soak up the sun. It has some of the most beautiful beaches. It’s just gorgeous. Take a dip in the clear turquoise waters, swim, snorkel, dive, hire a bike, eat out, view it from the air on a scenic flight or just sit on the beach. It has some amazing reef formations and tropical fish. This is a kid friendly island with many locals heading here with the whole family for a much needed break. The quokkas are real friendly but can be a nuisance so watch your food and look out for snakes as they are deadly. This island is jammed packed with things to do like golf, mini putt, a cinema and fun park. For the size of this island it has everything you want for a 3-4 day stay. After leaving Rottnest I then decided on a tour down to the southern point of WA . I went to such places like Augusta, where I did some wine tasting, and right down to Albany. Other places where we spent time were the Blowholes, Natural Bridge, Tree Top Walk, Elephant Rock and the Green Pool. The coast line down in the very south can be very rugged in places but there are still some very nice beaches and it’s a popular place for surfers. The city of Albany is situated on the Princess Royal Harbour and was the departure point for many New Zealand and Australian soldiers during WW1. On Mount Clarence is a memorial for an Australian and New Zealand soldier bearing the words ‘lest we forget’. From this spot is an awesome view of Albany and out to sea. When you head north from Albany you go pass loads of vineyards and then you hit the wheat belt. The wheat belt goes all the way north of Perth. I don’t know how far it actually goes but it has to be well over a thousand kms. On getting back from my tour of WA I then booked a day trip to Wave Rock. This trip included a stop at the famous Corrigin Dog Cemetery. Yes they bury their dogs in style and why not. Wave Rock is rather deceiving. On arriving there my first thought was that it’s not really very big. It looks like it slops up gently but when you go to climb up it further to get a photo you only get 5-6 steps and you just can’t get any further. The photos taken of me are the only way to see that it really is a big huge rock. When you are there looking up it is so different. You can get to walk right up on the top as its flatter and there is a small lake which is the water supply for the town of Hyden below. You get a view that just goes on forever. This rock has been dated as being 2700million years old and looks like a miniature of Ayers Rock. Next we walked along to Hippos Yawn. It looks like a hippo yawning thus the name. The rocks around here are so huge. Mulka’s Cave was next on the list. The name Mulka comes from an Aboriginal Legend. In this cave can be seen hand imprints than are much larger than the average human male hand. Interesting. From here back to Perth you are going through the wheat belt and every few kms you see these huge silos and drying yards. The biggest earner in WA is mining with wheat coming in second. 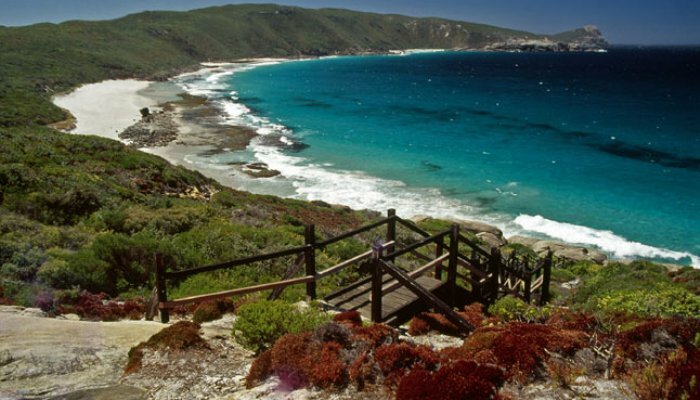 There are lots of tour agencies in Perth which offer day trips to places like Wave Rock and at a good price so make sure to do some. Suntan lotion of a high factor is necessary. Make sure to put it on before venturing out and re-apply during the day. On Rottnest Island hire a bike. They have small ones for the kids to. They also have a few buses that run at regular intervals from one end of the island to the other. 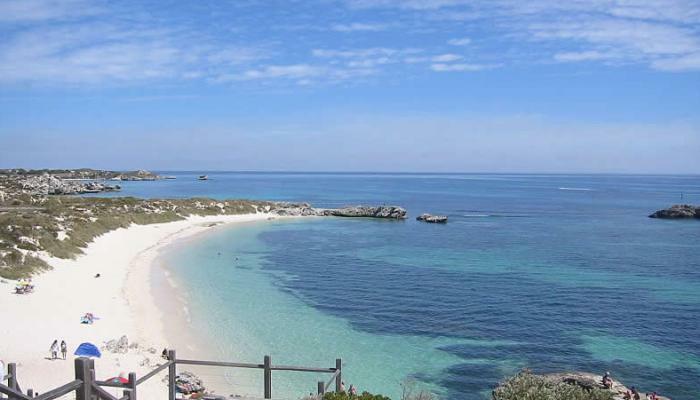 Book your accommodation before heading to Rottnest. It’s a very popular place and at the beginning of December when I went there it was already overflowing with tourists and locals. Take the trains or buses around Perth. Easy to use and they get you to everywhere and it’s so easy to use and get to Fremantle this way.